As an employment law attorney, I advise and represent employers, business owners, and human resource professionals in all aspects of labor and employment law. I also consult with and represent individual employees on occasion. My focus is on preventing employment disputes before they arise and seeking cost-effective solutions when they do. My goal is to provide first-rate, prompt and cost-effective representation and advice to our new and long-standing clients. We understand that employment issues play a major role in your businesses. Because the employment relationship impacts so many aspects of our lives, it is highly regulated. Federal, state, and local laws affect the way that you manage, hire, fire, compensate, discipline and incentivize your employees. In handling personnel issues, the old saying "An ounce of prevention is worth a pound of cure" is golden. We have found that telephone calls, office consultations, or even an email can save our clients thousands of dollars and substantial legal fees later. We balance the needs and demands of your business with our experience and knowledge of employment law to achieve practical solutions and to prevent employment problems. Mr. Clark provides employment counseling, advice and training seminars on a wide variety of employment-related issues. He regularly advises clients on the following matters: -Hiring practices -Compensation -Post-termination restrictive covenants (such as covenants not to compete and non-solicitation of customers and employees) -EEOC charges of discrimination -Department of Labor wage and hour audits/investigations -Wage and hour compliance -Employee manuals and handbooks -Employee evaluations and discipline -Terminations -Trade Secret Protection -State and federal discrimination laws -Reductions in force -Sexual harassment and other illegal harassment -Severance agreements for employees -Internal investigations -Negotiations, mediations, and settlements -Key Employment agreements and executive compensation -Litigation in state and federal courts and before regulatory agencies -Negotiations, mediations, and settlements -Key Employment agreements and executive compensation -Litigation in state and federal courts and before regulatory agencies We defend employers in state and federal court, and regularly handle administrative complaints, charges and investigations conducted by the EEOC, the Arizona Civil Rights Division, the Department of Labor, Arizona Industrial Commission, Wage & Hour Division, and the National Labor Relations Board. Experience and judgment counts in these forums and we are confident that our knowledge and know-how will be valuable. 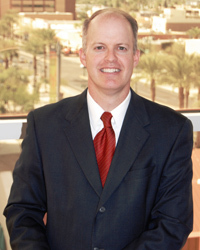 -Rated "AV" by Martindale-Hubbell the highest possible rating in terms of professional ability and ethical standards.